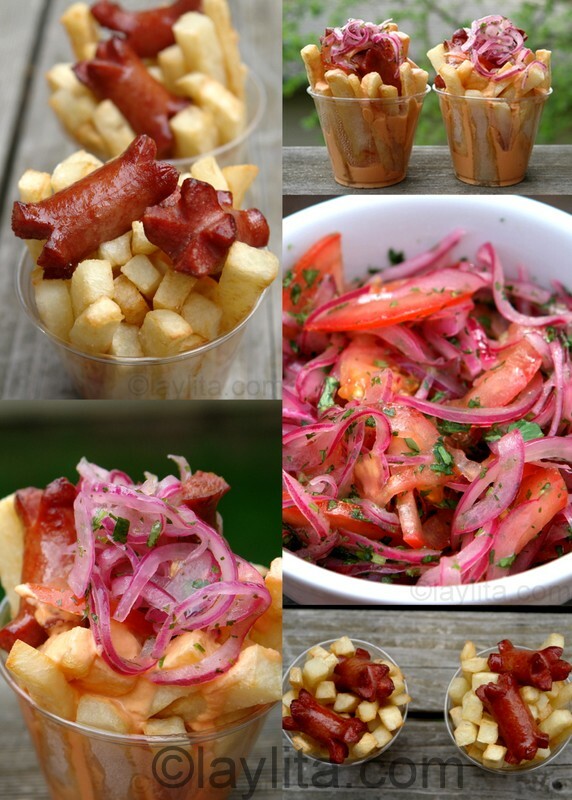 Salchipapas are Latin style fries served with hot dog sausages, and are a typical South American snack/street food. These salchipapas are topped with tomato onion curtido salsa and ahomemade salsa rosada. You know how sometimes you get cravings for greasy food? At least a few times a year I get cravings for salchipapas or French fries with sausage, which are extremely greasy, unhealthy, but sooo tasty. It all started at a place in the city of Loja called Soda Bar, a small salchipapa snack bar that was always packed. It had the best location: right on the corner of the Plaza Santo Domingo, a park where high school students (including yours truly) loved to hang out. It was also right around the corner from the only movie theater in the city and basically within blocks of three major high schools (La Inmaculada, Marianitas and La Dolorosa). I don’t think there is anyone in Loja, who was in high school or college during the 80s or 90s that didn’t set foot in the Soda Bar -and whose mouth doesn’t water remembering the taste of the “papas del Soda”. These salchipapa french fries were our drug. I’m not joking, I had friends who would pawn their jewelry at the Soda Bar in exchange for their delicious salchipapas. 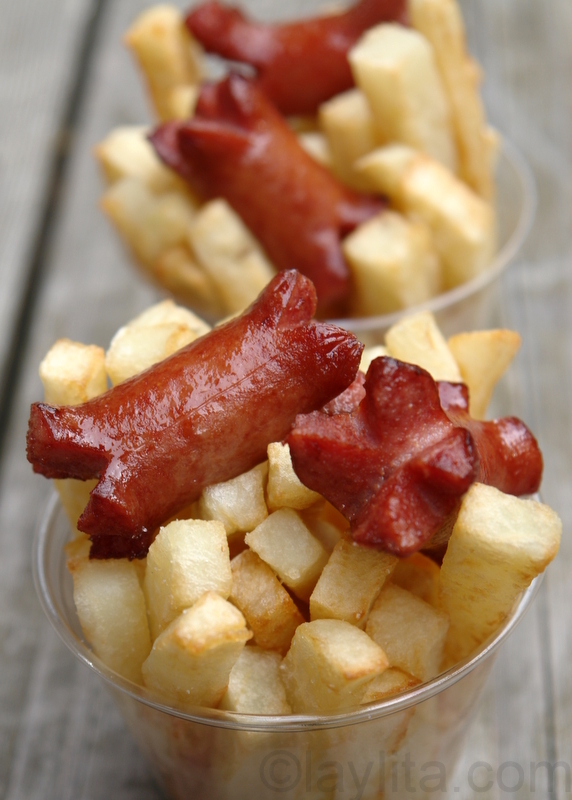 Salchipapas, or French fries with hot dog sausages, are a typical South American snack/street food. These salchipapas are topped with tomato onion salsa and homemade salsa rosada. Prepare a basic mayonnaise by blending the egg, diced onion, and lime juice until the onions are completely crushed. Continue blending and add the oil slowly until the mayonnaise begins to thicken, but don’t let it get as thick as you would if making regular mayonnaise, the consistency should be almost like a sauce. Add salt to taste and the milk, which is added to mayonnaise to help it keep a white color. Remove the mayonnaise, you don’t need to remove it all, just most of it, and add the diced tomatoes (and hot peppers if you dare) to the blender. 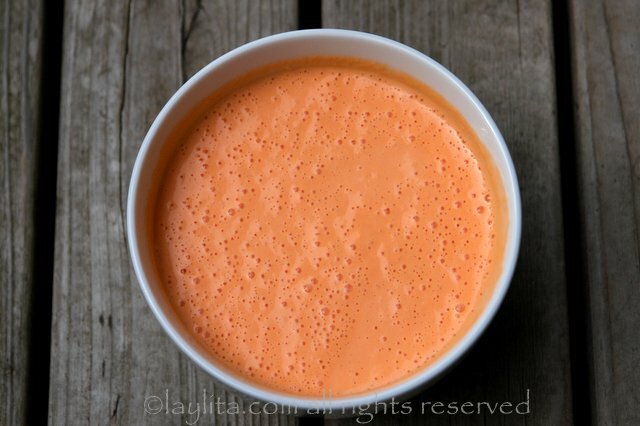 Blend the tomatoes until well pureed, begin adding back the mayonnaise and blend well, the sauce should be very liquid. Taste and add salt if needed. Soak the potatoes in cold water for at least 30 minutes. Drain and dry the potatoes, meanwhile heat the canola oil to 325 F in a deep fryer or deep sauté pan. Add the potatoes and cook until they are tender, but don’t let them get any color, about 10 minutes depending on their thickness. Remove the fries and place them on top of paper towels to drain the grease and let them cool down for at least an hour. Re-heat the oil to 375 F and add the fries, cook until they are golden and crispy, about 5 minutes. Fry the sausages separately or add them during the last 3 minutes of cooking of the French fries. Transfer to paper towels to drain the grease and serve immediately with the salsa rosada and curtido. The fries and sausages were cooked right in front of you and then served stuffed in plastic cups with a toothpick on top. 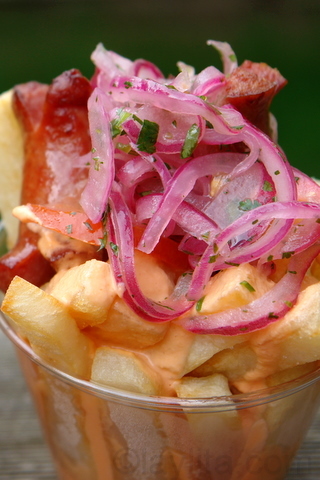 While there were a lot of places to get salchipapas in Loja, the Soda Bar was the most popular because of the amazing sauce that was drizzled on top of the fries. Their salsa rosada sauce was so amazing that everyone always ordered double sauce. Once the fries and sausages were all gone you lifted up the cup and drank every single sip of that sauce. 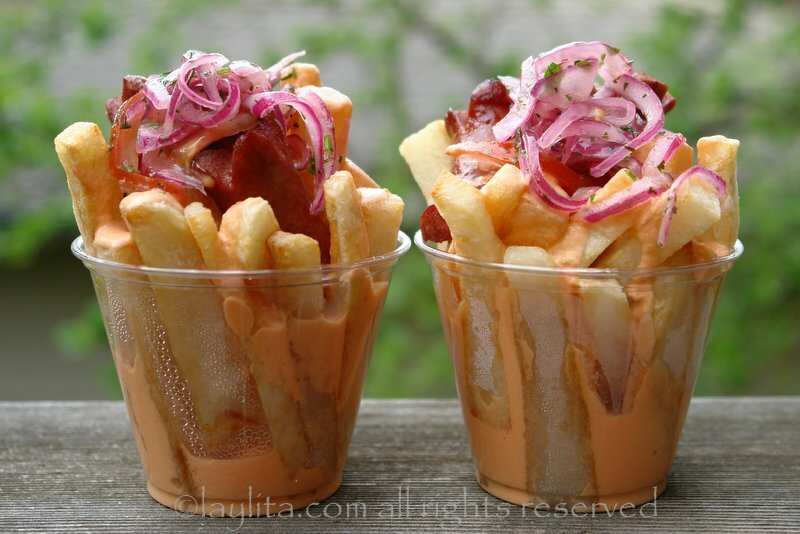 Most places usually serve salchipapas with mayonnaise and ketchup, either separate or mixed together and called salsa rosada or salsa golf. The sauce from the Soda Bar was a type of salsa rosada, but they made it entirely from scratch, using fresh tomatoes instead of ketchup. It was a very liquid sauce – compared to the thicker mix of mayo and ketchup. No one really knew how they made the sauce, apparently it was a secret, and as much as my friends and I experimented together we couldn’t get it just right. I’ve been trying to replicate this sauce for a long time and it’s good, if you’ve ever had the “papas del Soda” it will remind you of it, but it still isn’t an exact replica. Over the years I received some many suggestions for the secret ingredient of the sauce – even from people who haven’t tasted the original. These days I’m happy with my variation of the sauce – during our last visit to Loja I took my kids to try the original salchipapas del Soda, and they weren’t very impressed. After (briefly) wondering if they were really my kids, I decided to forgive them for not appreciating the original when they told me that they prefer our homemade version. There was another restaurant that also had memorable salchipapas. I’m not sure of the actual name of the place – even though it was right next door to my high school. In those days we simple called it “las papas de la Gorda”. These were also delicious, and while they didn’t have the special sauce, their fries were very nice and thick. Plus, they always served them topped with a curtido or lime marinated onion and tomato salsa, which I’ve incorporated into my homemade version of salchipapas. I also recommend eating these awesome Latin fries with some good spicy aji hot sauce and a nice cold beer. 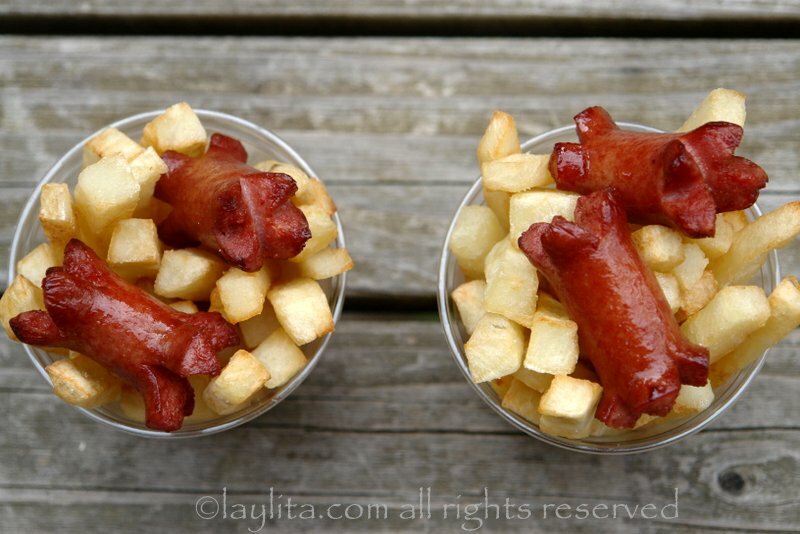 I probably don’t even need to say this, but your kids will love salchipapas and will think you are the best mom ever for making these (the nutritionist might disagree). You brought back such wonderful memories! I agree 100% with your description of “las papas del soda”. I live in New York now but I graduated at “las Marianas” in 1981 and left ecuador in 1982. When I go back, one of the first things I do is go to “Soda Bar”. My kids also enjoy them but maybe they just humor me because of how excited I get about them. Thank you for posting these wonderful recipes. I’m a late bloomer to cooking but now that I am enjoying it and have discovered you, I will be trying your recipes. I’m thinking about making this for the Super Bowl. Could you make the salsa rosada a day ahead? Thank you! Hi Melanie – Yes, just keep it refrigerated. I also like to make a few different sauces as options for dipping: a cilantro garlic mayo or aioli goes great with the salchipapas, creamy avocado salsa, etc. I have to repeat it but damn you have one lucky husband!!! No sabes tu la alegria que me das al poner la receta de la salsa del Soda……. actualmente vivo en Pto Rico pero soy de Loja, creci en la pradera y me eduque en la Inmaculada hasta los 7 anios…. y no hubo semana que no valla al Soda y me coma unas “papas con salsa” jijijijij que felicidad y que alegria que hallas obtenido la receta… voy a hacerla en cuanto no pueda. Muchas pero muchas gracias…. You my friend, have brought back fond memories when I lived in Cuenca, Ecuador. 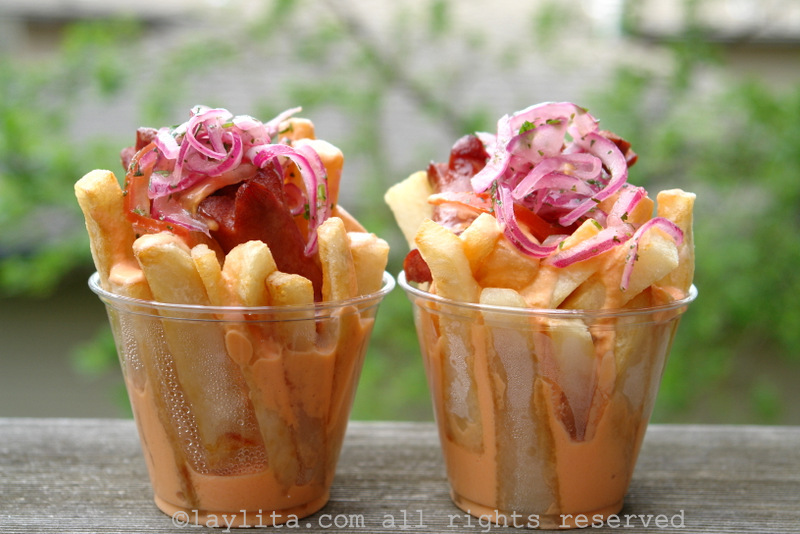 If there is one thing I miss it’s the Shrimp Ceviche, Llapingachos and of course the infamous Salchipapas!! Because of this well written recipe and pictures that make me kiss my screen (twice), I will be having my Salchipapa fix this weekend here in NYC. ahh, salchipapas. I remember growing and eating them as a kid in lima, peru, 50+ years ago. Of course with ketchup, mayo and a lil mustard. Yum. No way! My dad and I went to that place all the time when we lived in Ecuador. I’m surprised that I found it just now as my mom and I made llapingachos. What a blast for the past! Thank you for posting the recipe and the history as well. I used to have salchipapas every day between classes in Cuenca! I never thought of making them here, but seeing this makes me want to try. Thank you so much! This site brings back so many memories and I love it! Hi Heathercita – What kind of peanut soup are you looking for? Does it have meat/fish/vegetables? Also for empanadas, here is a link for fried cheese empanadas or also baked cheese empanadas. Hi Gary – I love your photos! 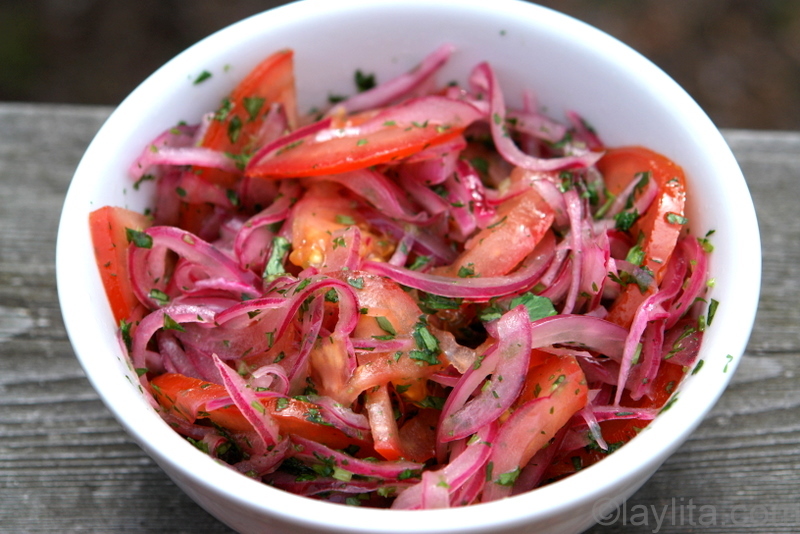 I like the idea of adding dill to the salsa rosada, but I don’t think it’s the secret ingredient, there aren’t any green herbs in the sauce, some of my friends speculate that it might be a tree tomato or tamarillo. Could the missing salsa rosada ingredient be dill? I have family out in Utah, and I can remember from when we went out there that all the restaurants serve “fry sauce” with their fries instead of ketchup/etc. We’ve tried to make it at home a few times, and all the recipes seem pretty similar to this, with the exception of a small amount of pickle juice. My parents used to make hotdogs the exact same way, but cook them in a pan instead of frying them in oil. In fact, I just made those a few days ago: oh the memories! I can’t wait to go home and show this to my husband. He is from Cumbe, Ecuador, which is outside of Cuenca. He has mentioned Loja many times. Something about a pilgrimage that they take to Loja…annually, maybe? Anyway, I visited Ecuador with him last year and we enjoyed salchipapas several times. Many people were selling them on the street in his town and his (mine, too) sister-in-law sells them on the weekends. Yummy street food! Perhaps this will be on our menu this weekend…he would love it! Oh my goodness, I’m drooling. Lovely post. What a great post! Salchipapas are also popular here but have never really been something I have loved. You make them look so much better!